Wartime Mitsui Life Insurance ad card. Dated Feb. 1942, this advertising postcard shows a Japanese torpedo bomber dropping a torpedo aimed at a US battleship under heavy attack. An American flag (faint) can be seen on the ship's mast. Dated Feb. 1942, this advertising postcard shows a Japanese torpedo bomber dropping a torpedo aimed at a US battleship under heavy attack. An American flag (faint) can be seen on the ship's mast. The advertising copy reads, "This one shot is a phenomenal force." On the left, the text reads, "A new weapon for national savings." "Very low insurance premiums." "Mitsui's provision for old age" "It has no enemies!" For some reason, the left corners of the card were cut with scissors, perhaps to remove it from an album. Of course in Hawaii, Dec. 7 is a day of national mourning as much as Hiroshima/Nagasaki Day in Japan. Each country mourns its own and neither seems to care about the other's war dead. I await the day when both countries mourn for each other as well as for themselves. After all, we all belong to the same family, the Family of Man. The ship in the picture is represented as the U.S.S. Saratoga (it can be identified from her sister ship the U.S.S. Lexington by the vertical black band on the funnel). The Japanese believed that one of their submarines sank the Lexington in January 1942 - this was actually the Saratoga which was damaged but not sunk. 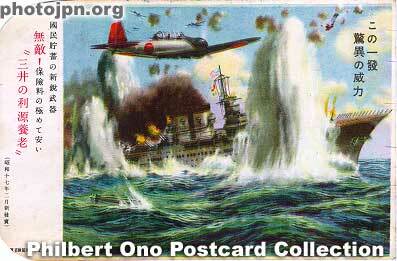 The card probably represents the Battle of the Coral Sea (May 1942) where their carrier planes did sink the Lexington. A great card that I much enjoyed finding on the Internet! Ah I see! So it's an aircraft carrier and not a battleship. The ship under attack is clearly the USS Saratoga CV 3 identifiable by superstructure and smokestack marking (vertical line). This ship survived WW II. Ironically, its one sister ship, the USS Lexington CV 2 (smokestack marking horizontal line) was sunk in the Battle of the Coral Sea in 1942. A close relative of mine served on both ships.